The downthetubes news blog was assimilated into our main site back in 2013. Hop over to www.downthetubes.net for other British comics news, comic creating guides, interviews and much more! British comics fan Jonathan Clode has launched an appeal for contributions to an anthology to mark the outbreak of World War One next year - and has already got creators on board willing to contribute. In a posting to the downthetubes forum he explains: "2014 marks the centenary of the First World War. In years gone by, comics about World War One and World War Two were common place, and in France and Belgium they are still produced and very much revered. "My goal is to revive and reinvigorate this part of the genre, and in doing so commemorate the lives and deeds of those men and women who were affected by ‘the war to end all wars’. "I am putting together an anthology of stories each ranging from 6-10 pages in length. The subject matter can be anything that relates to World War One, as long as it is honest and does not seek to glorify war. It can be historical or fictional using any style you like - the only stipulation being that it has factually accurate context (i.e. you can create characters and put them in a fictional aspect of the ‘Battle of the Somme’, but ensure the detail around the battle is correct). 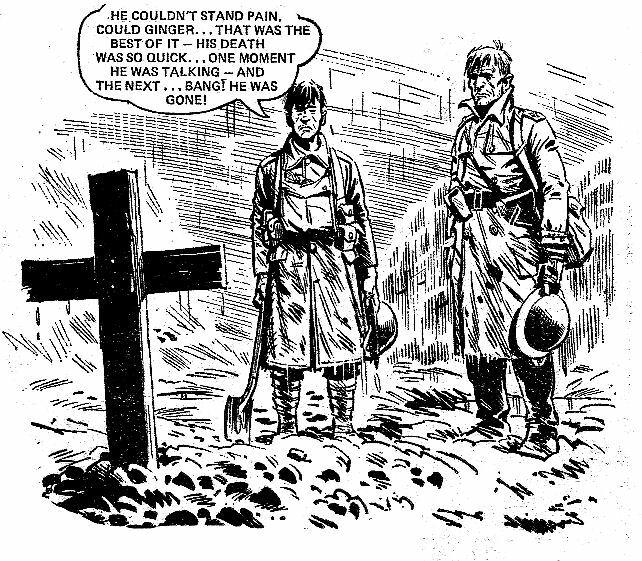 "Anyone who has read Charley’s War by Pat Mills & Jim Colquhoun will know what I’m going on about! "I also aim to add poems and diary entries alongside single illustrations," he continues. "These would appear between each story. "There will be numerous events to mark the [World War One] centenary across its four year duration, and I really feel that this could be a powerful piece of work, both as a sentiment of remembrance, and as an example of how diverse and evocative our medium can be. "Publishing options will be looked at once a few stories have come together and folks are on board. If there’s anyone around who’d care to join me in taking charge of this thing, I’d be glad of that too. "In the 48 hours since I posted this idea on a few other sites I've already had responses from Italian, Canadian, American and British creators with some wonderful ideas; enough for around five stories. What I'd like is a few more UK creators, being as this is inherent to our history and character. "This has always been a subject of immense interest for me, and with a little luck there are a few of you out there who feel the same!" 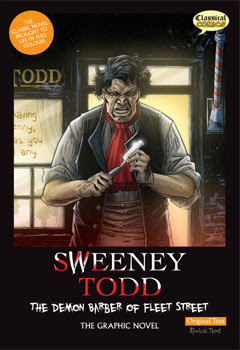 The shortlist for the 2013 Stan Lee Excelsior Awards has been announced and includes two British titles - Strontium Dog : The Life and Death of Johnny Alpha and Classical Comics' Sweeney Todd - alongside several overeseas projects. Created by Paul Register from Eccelsfield School, the Awards started out as a Sheffield-based project, attracting the interest of 17 Schools in its first year. As word spread, last year the project, which aims to encourage reading in younger people, attracted 77 schools - and not just from Sheffield. This year, so far, over 100 schools have signed up, including schools from outside the UK. The award is named after (and with permission of) Stan Lee, creator and co-creator of many of Marvel Comics' most iconic and world recognisable comic characters and groups. The Stan Lee Foundation (set up to improve literacy amongst children in the US) gave its blessing to the awards in its first year. This award is the only nationwide book award for graphic novels and manga where kids aged 11-16 choose the winner from a selection of books by reading and then rating each graphic novel they read. "Eight graphic novels are selected for the shortlist and it now attracts dozens and dozens of schools and public libraries from all over the UK - from Scotland to Jersey, from Belfast to Gateshead," explains Paul. "The overall goal of this scheme is to encourage reading amongst teenagers. "However, its secondary target is to raise the profile of graphic novels and manga amongst school librarians and teachers. "This storytelling medium has been a largely underused resource within education for many years," he feels. "The Stan Lee Excelsior Award attempts to highlight some of the amazing books that are out there - books that fully deserve to be in our school libraries alongside regular fiction. "We work closely with both the School Library Association and the Stan Lee Foundation. We are thrilled that 'Stan The Man' has given us his blessing and his permission to name this award after him." The Awards remain rooted in Sheffield in terms of organisation, with specialist comic book retailers Sheffield Space Centre, who have been involved since the first year of the awards, helping with book selections, library supply and attending the awards ceremony. Sheffield creative company Digital Story Engine have also been involved, providing video coverage and interviews with many of the writers and artists involved. An awards ceremony will be held at Ecclesfield School in July, when the top three graphic novels are announced, with school children at the awards ceremony given the chance to meet and talk to writers, artist and publishers involved in the comic book industry. • If you are a pupil and want to get your school invlved in these awards, talk to your school librarian and point them to the website - www.excelsioraward.co.uk - or, if you are involved with school’s Libraries, or libraries, check out the website for more information, too. 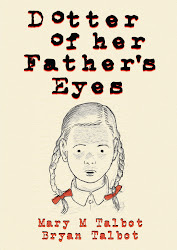 Talbots scoop Costa Award for "Dotter of Her Father's Eyes"
Mary Talbot's Dotter of Her Father's Eyes has won the biography section in the 2012 Costa Book Awards. Drawn by husband Bryan Talbot, the award has delighted the couple, who The Guardian reports have known about their win for some time but had to keep quiet about it. While this is not the first graphic work to win a major literary prize – Art Spiegelman's Maus won a Pulitzer in 1992 and Chris Ware won the Guardian first book prize in 2001 for Jimmy Corrigan: the Smartest Kid on Earth – the Costa Award is still a significant moment for the graphic medium and 2012 marks the first time comics have featured in the Costa nominations (see news story). "It is a good thing for graphic novels as a whole," Bryan Talbot told the Guardian, whose works include The Adventures of Luther Arkwright, The Tale of One Bad Rat and Alice in Sunderland. "Graphic novels are becoming increasingly accepted as a legitimate art form." 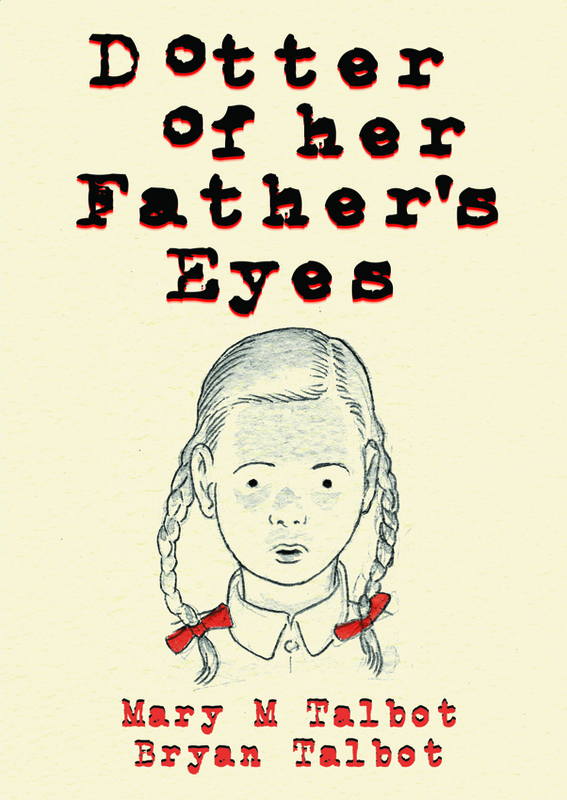 Dotter of Her Father's Eyes tells the story of James Joyce's tragic daughter Lucia, who spent the last 30 years of her life in a mental institution. Into that tale, Mary Talbot has woven the story of her own troubled relationship with her father, the eminent Joycean scholar James S Atherton. In other categories, Hilary Mantel won the novel award for Bring Up the Bodies; Francesca Segal won first novel for The Innocents; Kathleen Jamie's The Overhaul came first in poetry, and Sally Gardner's Maggot Moon was named children's book of the year. Among the nominations this year were Days of the Bagnold Summer by Joff Winterhart while artist and writer Dave Shelton, who writes and draws Good Dog, Bad Dog, for both The DFC and Phoenix was shortlisted in the Children's Book category with his novel A Boy And A Bear In A Boat (see news story). 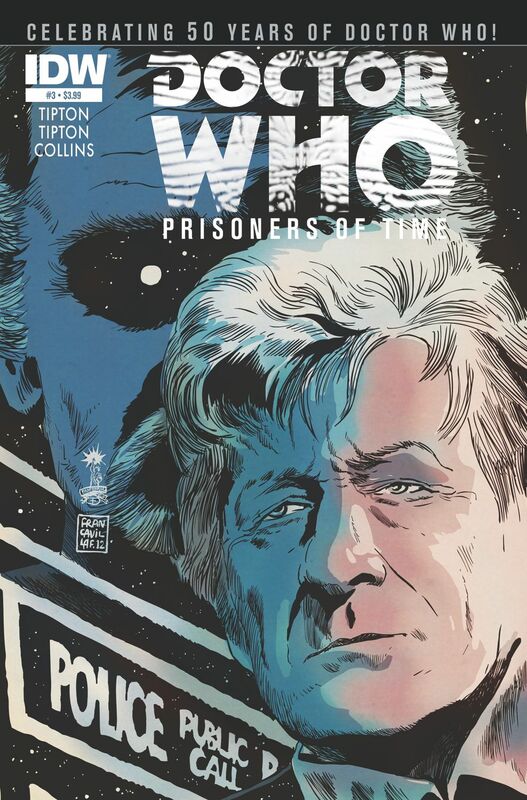 British comic creators look set to be heavily involved in US publisher IDW's Doctor Who at 50 celebrations with Simon Fraser and Lee Sullivan among the artists involved in their 'Prisoners of Time' maxi series, which launches this month. 'Prisoners of Time' will feature every incarnation of the Doctor, as well as a long list of villains, including the Zarbi from the TV story best known as The Web Planet. 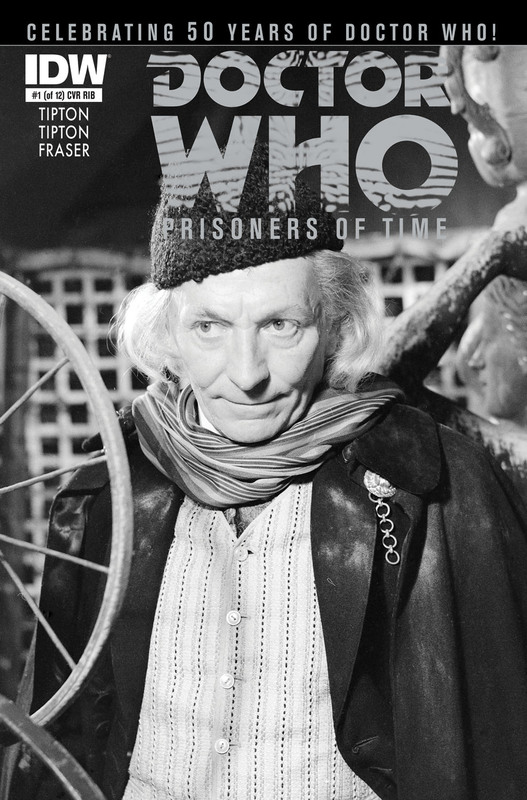 The opening issue is being offered with two covers, one by Simon Fraser and the other a photo cover from publicity stills from the original Doctor Who episode, 'An Unearthly Child'. "It's a 12-issue miniseries featuring all 11 incarnations of the Doctor," co-writer David Tipton told Comic Book Resources. "Each Doctor will be featured in one of the issues." 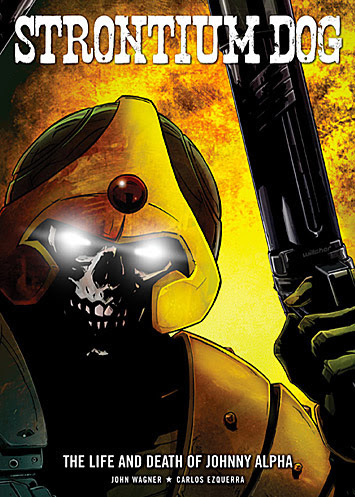 "And of course, there's a larger mystery spanning the course of the series," added co-writer David Tipton, "one which is set up in the opening pages of issue one, and which will increasingly come to light as the series progresses." As yet, apart from the Zarbi, the villains who will play a part in the story have yet to be revealed. 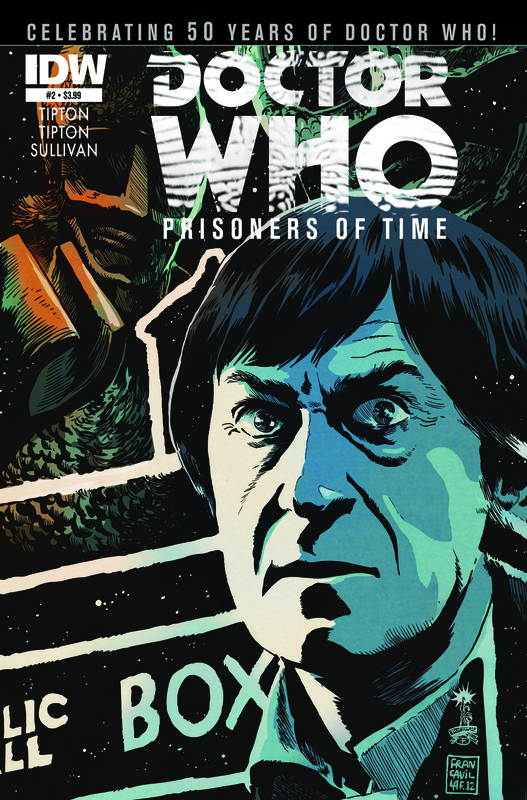 Lee Sullivan has drawn the Patrick Troughton-Second Doctor story for #2 and Mike Collins has drawn the Pertwee-Third Doctor segment for Issue 3. As well as the story, each issue will include an essay on the featured Doctor by prominent Who experts. Producer, director and script editor for Big Finish Productions, John Ainsworth provides these for #1 and #2, with Gary Russell contributing to #3. 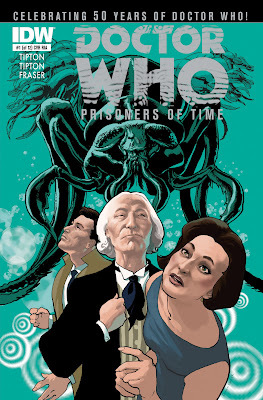 • Doctor Who: Prisoners of Time #1 written by Scott and David Tipton with art by Simon Fraser goes on sale 23rd January from IDW Publishing. 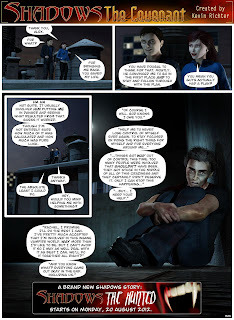 (Updated 9th January) In a story that echoes the final days of Pete Nash's Striker comic strip, The Sun newspaper has decided to drop its vampire-inspired Shadows saga on Friday, leaving creator Kevin Richter little time to wrap the current storyline. Posting on the Shadows Facebook page, Kevin announced yesterday that "Shadows will come to an end this Friday (4 January). "The Sun have decided they would rather have a former comic return to the paper than carry on with Shadows," he explained. "I was only told this news about two weeks ago and have had to wrap up the current story rather quickly. Which is a big pity as I had a lot planned for The Hunted, and future story lines, that I won't get to finish properly now. The Hunted will be ending on page 99, which is roughly 200 pages shorter than what I had planned for this story." The announcement prompted speculation from fans that the "returning strip" might be football strip Striker, although creator Pete Nash has previously stated he felt the story had run its course. Update: On 7th January, the football strip did indeed return to the newspaper. When Striker was dropped from the newspaper in 2009, Nash was also forced to shorten his final story in the newspaper, although as the series' creator he went on to publish the strip online and it found a temporary home in Nuts magazine. It's been some time since Pete made any further announcements about the comic, despite hopes in 2010 that a new outlet for the story would come to fruition by the end of 2010. Update: However, his persistence now seems to have paid off with a return to the paper where the strip began. Another strip, fantasy tale Axa, was also dropped mid story with a few strips unpublished and the story was never resolved. Unlike Striker, Kevin Richter does not own Shadows, so it seems there seems little hope for any further stories at this time, and the story's Facebook page is facing deletion. "It would be good to carry on with it, if we could get the copyright, but there's probably no chance of that happening," says Kevin. "It is literally more than a full time job creating something like this and the chances of making money on it away from the newspaper is very slim. Despite the sudden end to the saga, Richtman is keen to thank his fans for their support. "I just want to thank all of you for reading Shadows," he says, "and for your thoughts and comments here on the Facebook page, it really encouraged me and helped me, hopefully, write better stories. I will miss working on Shadows. "... Comics are what I do though, so I will continue," he insists. "I have many ideas waiting to happen and will be concentrating on them this year. I will of course keep you guys informed. That is assuming you want to read anything else besides Shadows that I produce!" The Sun also publishes a Wallace and Gromit daily strip, produced by Titan Comics. There is a roster of six writers on that strip - Richy K. Chandler, Luke Paton, Mike Garley, Gordon Volke, Will Dawbarn and David Leach - three artists - Mychailo Kazybrid, Jay Clarke and Sylvia Bennion - and Bambos is the strip's inker and John Burns is the colourist. The strip is lettered and edited by David Leach. (Via the Eagle Times blog): The 100th issue of Eagle Times, the journal of the Eagle Society, is available now. The picture on the cover of the issue (Volume 25 No 4) is from the Dan Dare story 'Operation Saturn', art by Desmond Walduck (from Eagle, Vol 4 No 38, 24th December 1953). Rivals of Jeff Arnold - Hopalong Cassidy. A look at the origin (1904) and development of the character (from the 1930s through the 1950s) in film, radio, television and comics of the fictional cowboy hero, created by Clarence E. Mulford and played on the screen by William Boyd. 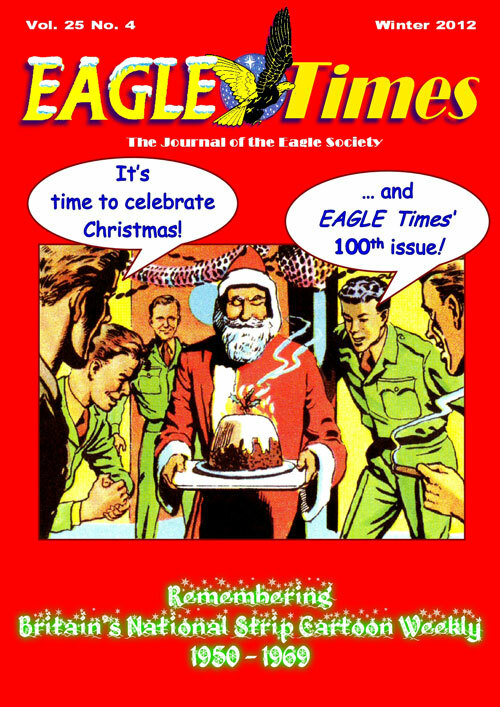 • To get a copy, join the The Eagle Society via Annual Subscription to Eagle Times magazine, which is published four times annually. The Subscription rate for 2012 is: UK £27; Overseas £38 (in £s Sterling, please). Postal applications to: Keith Howard, 25A Station Road, Harrow, Middlesex HA1 2UA, United Kingdom. This week, a scant eighth of the way into the 21st century that had already been mapped out for many children - and adults - we lost a true icon of British television and film. 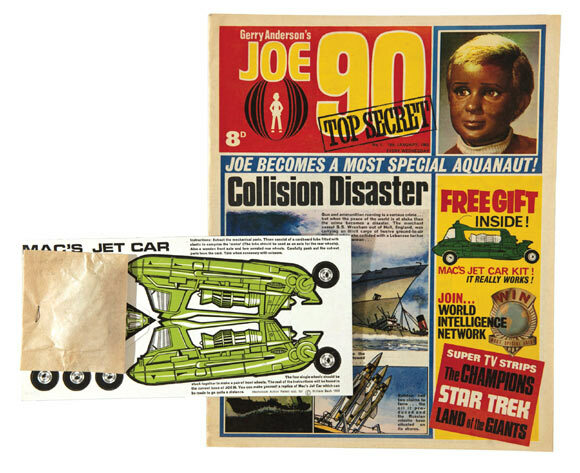 The hallmark of Gerry Anderson's most famous and loved series was a setting one hundred years on. Now, at a halfway mark, we are in a unique position to see the past fifty years since series like Fireball XL5 must have opened eyes to the wonder of space, and wonder differently if now and in the next fifty years, the hope and optimism of Thunderbirds - his most human and accessible of series, speaking to every generation - is as much a fantasy as the universe of Steve Zodiac. in these dire social and economic times. 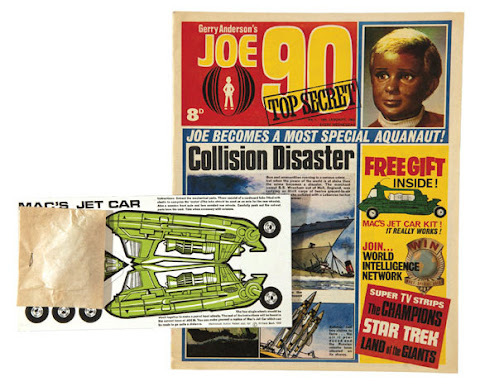 I only met Gerry once, briefly at a convention many years ago, and spoke to him on one other occasion, trying to arrange an interview for the Gerry Anderson Complete Comic History website - an interview that, unfortunately, never happened. Unlike others, I never got the chance to tell him how much his series, and particularly the comic and annual tie-ins I starting reading when only four years old (Joe 90: Top Secret), had meant, and continued to mean something and inspire well into adult life. What that briefest of conversations confirmed is what many have already said, and probably far better. Quiet and modest, polite and gentlemanly. An incredible far cry from the action heroes he created but then, to other creatives, inspiration can also come from a quiet determination to do better, to raise the bar. Gerry's shows did that not only for the whole British and television SF genre, but also his own. During the 1960s, each new series was technically more brilliant than the last, and tried to push the envelope. Not always successfully but at least he showed a willingness not to full into a rut. Another strength of his was recognising talent and giving those people under him the chance to flourish, producing quality work - names like musician Barry Gray, effects expert Derek Meddings, scriptwriter and editor of TV Century 21 Alan Fennell. Names which, like Gerry himself now, are no longer with us and have left their own legacies. It was Fennell himself, writing in the Thunderbirds Television Mail Supplement in December 1965, who perhaps put his finger on the reason for success: "All the old 'do's and don'ts' of publishing had been ignored in one fell swoop. The originators asked why things could not be done... and then did them." 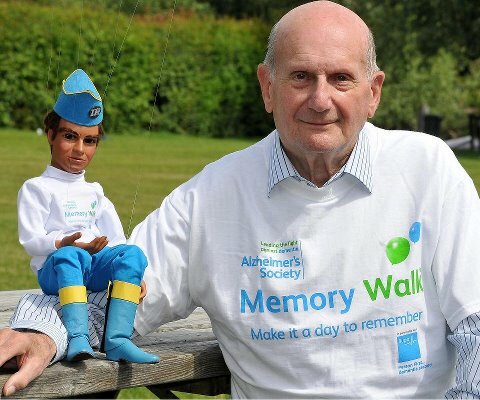 Gerry Anderson was not a born maker of puppet films, it was a serendipitous event that he became involved when no other opportunities to produce were about. So his outsider approach, the question presumably being 'Why can't we make puppet films as well as any other?" and then doing just that, is what does make them stand out. No-one had made puppet film series with such utter conviction and daring, and, if we're honest, no-one has ever come close to bettering them since. Which is why, close to the fiftieth anniversary of the creation of Thunderbirds, that series quite rightly lives on as the pinnacle of his success. It had real human values. It was a true family show. It put life above all else, in a world where - still evidently not learning from historic mistakes - it is sometimes placed last over commercial and political concerns. But his legacy does live on, in every media conceivable. Hopefully, for at least another fifty years, until we reach those well-imagined and immaculately believable 2060s. Thank you, Gerry. A lot of us are where we are now because of you and your team, because you all inspired, and made us believe not only what was possible - but more. • Got a British Comics News Story? E-mail downthetubes! Check out the main DTT site! PLEASE NOTE: The main downthetubes.net now features all our news direct, as well as interviews and other features on British Comics and more. downthetubes was nominated for an SFX 'Blogger' award in the category for 'Best SF News Blog'. We didn't win, but thanks to everyone who voted for us! downthetubes is the creation of and © 2012 John Freeman. All the articles published on this blog are © their respective writers. Images featured here and on the downthetubes sites are copyright their respective creators or publishers and are only used here for review or promotional purposes. downthetubes.net is a British Comics web site edited by John Freeman with much-appreciated contributions from a band of writers that includes Matthew Badham, Jeremy Briggs, Dave Hailwood, Brian D. Morgan, Richard Sheaf and Ian Wheeler. It features comics links, interviews, features and a guide to writing comics. This blog is where you will find all our latest news items. The site downthetubes.net, which began publishing in 1999, is edited by John Freeman whose credits include editor of Doctor Who Magazine, Star Trek Magazine, Star Wars Magazine, and Marvel UK titles such as Overkill, Death's Head II, Warheads and others. He's currently editor of the upcoming Strip Magazine for Print Media Productions. • Jeremy Briggs contributes news, reviews, interviews and historical articles on British comics. He is a guest writer on Steve Holland's UK comics history blog, Bear Alley, and has written for Comics International, TV Zone, Spaceship Away and Omnivistascope. • David Hailwood has written comic strips for various publications, including TOXIC, Accent UK, Bulletproof and Futurequake. He also writes comedy material for TV, and regularly contributes to the Temple APA (a showcase for UK comic writers and artists). • Ian Wheeler is a freelance writer who also edited the highly-acclaimed British comics fanzine Eagle Flies Again. Can you help support DownTheTubes? Put together by volunteers to promote the British comic industry since 1999, we hope you enjoy our work on www.downthetubes.net. While we do generate some revenue through Amazon links and Google ads, we'd welcome support our work. Although Blogger is free, the running costs of our main site and forum are around £500 a year. We'd also welcome new contributors! If you'd like to contribute to our site by writing news stories or features, please also drop us a line! There's a massive amount of goings on in the world of British comics and we know we miss some! If you're planning on going to attend a comic convention or signing, or would like to submit reviews, have a look back through our posts to see how we format them. downthethetubes © 2012 John Freeman. Articles and images © their respctive creators.. Simple theme. Powered by Blogger.